Punk rock was profoundly important to me. The power, the rage and the message. It was authenticity incarnate. A clarity and directness with a political message that was overpowering. As big corporations watched, they started to smell money. They circled and studied. And they aped the aesthetics, but we knew it was fake. Now, I hear The Clash or The Stranglers or The Undertones and I am still amazed. The corporate fakers faded away and the real deal survives. I believe that punk rock experience is core to the values of a generation. 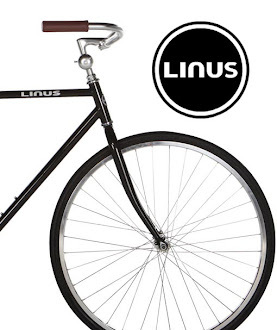 DIY is not a marketing term or a cliche, we know we can do it. We can create it ourselves and form businesses that reflect our personal passions. The Maker Movement, the rise of crafting, the slow food movement - they share a commonality of power through engagement. We, as individuals, are personally awesome and we want to collaborate. Jenny Hart is no stranger to D+R readers as she is our longest running perma-guest blogger. She has inspired us with her work and the passion of her business Sublime Stitching. For me, selfishly, the greatest benefit of starting D+R has been the gracious contributions of my co-hosts. To see what inspires them, what moves them to create. All too infrequently, I fail to recognize how important my co-hosts contributions are to me personally. Thank you. As corporations take notice, just as punk rock was diluted to the point of simple aesthetics, the fakers are trying to establish credibility. Besides so brazenly copying Jenny Hart's designs, Urban Threads has disingenuously positioned themselves as an indie company built by a single individual. 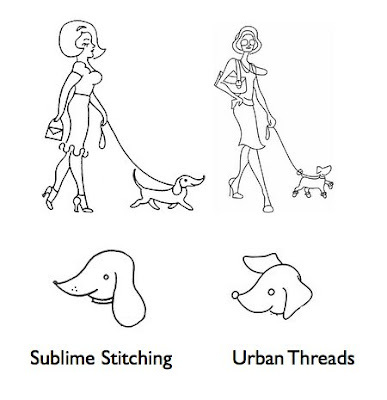 A little whois and Google mapping show that Urban Threads is not a charming home run business, but rather an offshoot of a long established machine embroidery business called Embroidery Library. Is Embroidery Library a giant faceless corporation? No, I don't think so. Seems to be a smallish, long established company that has been cranking out machine embroidery patterns for years. Like the rest of us with independent businesses, I am certain they have stretched their budgets, wondered how to grow and hoped they could compete on a national scale. If it were a major corporation, it would be easier to understand as they operate behind an opacity of scale and lawyers, but how in the whole wide bing-bong world would a smallish company think it would be a good idea to copy Jenny's patterns? 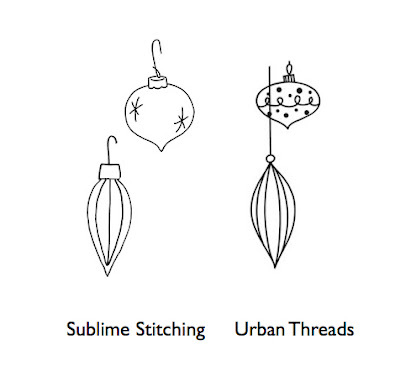 Embroidery instructions have existed for hundreds of years, so why would Urban Threads chose to re-word Sublime's instructions? To butcher Jenny's quotes and represent them as their own? That is not a very punk rock thing to do. 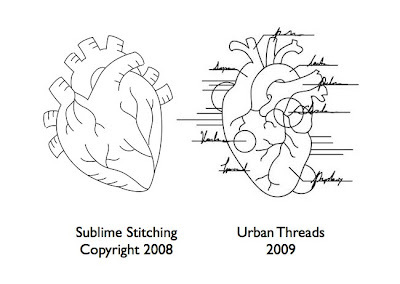 Urban Threads has so brazenly ripped off Sublime Stitching that I can't help but wonder if Jenny Hart is the only artist that has been ripped off. 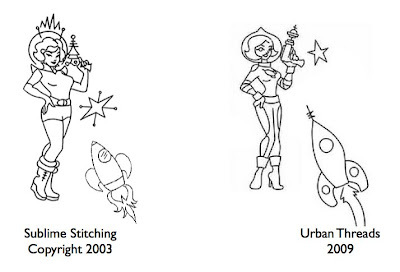 Please, take a moment to look at the Urban Threads catalog of designs and see if you recognize any other chicanery. Let us know, we will pass it along. Today, send our friends at Sublime Stitching a note of support. And, while you are at it, drop a note to Urban Threads and tell them where to stick it. Hey big companies! Don't rip us off! We want to work with you! Contact us! We value your experience! Let's make this huge! We all win when we collaborate! Rip us off and a thousand blogs will descend on you!